TUCSON, Ariz. - NASA's Phoenix Mars Lander's robotic arm will use a revised collection-and-delivery sequence overnight Sunday with the goal of depositing an icy soil sample in the lander's oven. "We are going to modify the process we ran on Sol 60 to acquire another icy sample and attempt to deliver it to TEGA," the Thermal and Evolved-Gas Analyzer, said Barry Goldstein, Phoenix project manager from NASA's Jet Propulsion Laboratory in Pasadena, Calif. "We will repeat what we did successfully with small modifications to adjust for what we learned." 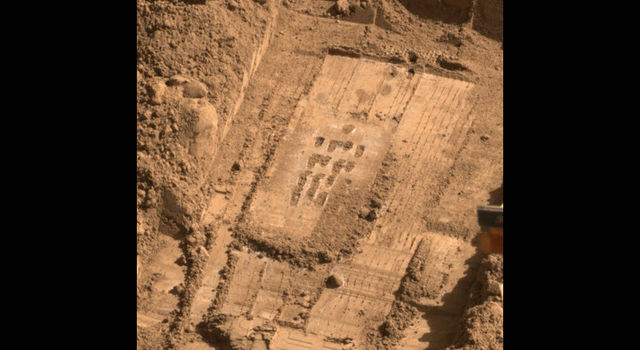 The Sol 60 effort on July 26 by Phoenix successfully obtained a sample by rasping 16 holes into and scraping the work trench informally named "Snow White." Most of the sticky Martian soil adhered to the scoop even after the scoop was tipped and the rasp activated to help sprinkle soil into TEGA. The revised plan includes reducing the length of time the rasp operates as it makes the holes in the trench to reduce any potential heating of the sample, and for increasing the number of times the scoop is vibrated during the sample delivery action. Images received Sunday morning showed the soil collected on Sol 60 had fallen out of the scoop, which had been left inverted over the lander's deck. The Phoenix mission is led by Peter Smith of the University of Arizona with project management at JPL and development partnership at Lockheed Martin, Denver. International contributions come from the Canadian Space Agency; the University of Neuchatel; the universities of Copenhagen and Aarhus, Denmark; Max Planck Institute, Germany; and the Finnish Meteorological Institute. For more about Phoenix, visit: http://www.nasa.gov/phoenix and http://phoenix.lpl.arizona.edu.